These is to inform the general public that TSTV has commence the sales of its newly improved decoder these February 13, 2019 and all lovers of movies, sports, entertainments shows, musics and so on can now get to buy from any outlet nation wide. 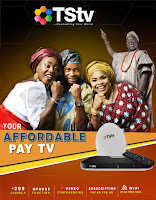 We just confirmed the new connection parameters for installation of TSTV decoders for 2019. We at peter odibo's blog is sharing with you the latest and newest TStv Africa tracking Position and frequency. Polarization: H/V but use Vertical which is more preferable. According to TSTV Africa, there are more than 50 channels even up to 70 channels will be showing on the TV.